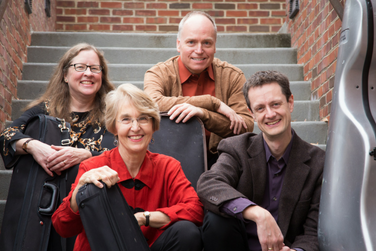 The Left Bank Quartet presents a “Polish Revival” featuring musical works by two powerful 20th century voices from Poland and curiously, a sublime late work of Beethoven. Commemorating the 100th anniversary of his birth year, Mieczyslaw Weinberg’s music is experiencing a sharp uptick in interest revealing his strong connection to the Russian tradition, inspired by the spirit of Dmitri Shostakovich. The deeply nostalgic and quirky Quartet No. 8 serves as a foil for the music of feisty Grażyna Bacewicz—a woman who broke many “glass ceilings” in her career. Her Quartet No. 4 draws upon Polish folk music and incorporates highly innovative techniques that only a top-flight violinist could have devised. Another Polish virtuoso, Henryk Wieniawski, is credited, along with his superstar quartet, of singularly reviving interest in the string quartets of Beethoven through a series of historic concerts in London in the 1850s. You will hear why these virtuosos were so challenged and enchanted by these transcendent yet dormant works with the triumphant E-flat Quartet, Op. 127!